Overview — As evidenced by the 1975 movie classic "Jaws," the great white shark has both fascinated and frightened humans since its ominous presence first became known. These powerful fish can kill a person with a single bite, but not necessarily because they want to eat us. Studies suggest surfers and flailing swimmers remind the great white of other prey that it would normally go after. When presented with human dummies, the sharks showed little interest. Nonetheless, each year one or more encounters with a great white usually is reported in the United States, since the shark's habitat goes all the way from the surface down to well over 4,000 feet. Feeding Habits — When considering the diet of the great white, it is almost easier to list what it does not consume, since virtually anything living in its path might be a potential meal. Favored prey includes fishes like salmon, hake, halibut, mackerel and tuna. It will also eat other sharks, blubber from whale carcasses, sea turtles, birds, seals and porpoises. When examined by researchers, one Canadian great white's stomach was found to contain three entire porpoises. One of this shark's impressive hunting methods involves charging, mouth open, into a victim from below. The quick bite, made with teeth shaped like arrowheads, may be all that it takes. 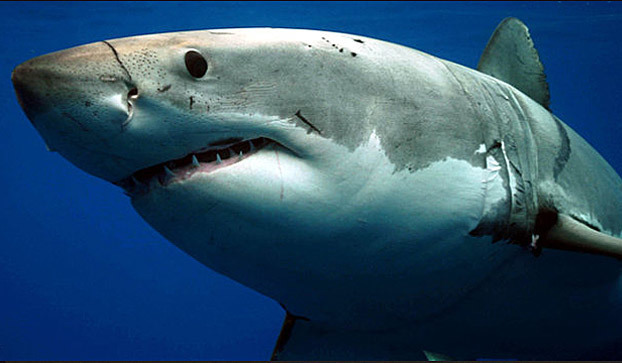 Cool Fact — When a great white attacks, its eyeballs roll back into its head to protect them from injury.